Hi guys - As this post goes live I am either still in a plane or somewhere over a desert... hopefully with a cocktail in hand of course. I will be blogging when I get to Dubai, but in the meantime I have a special guest on the blog today with a gorgeous tutorial. Say hello to the fabulous Sarah from TOMFO. Firstly, may I say... I'm so thrilled to be playing Cinderella while the gorgeous Sonia is off riding camels in Dubai. While she's off, shopping till she drops and being Carrie in a Kaftan I'm taking over her fabulous blog for the day. 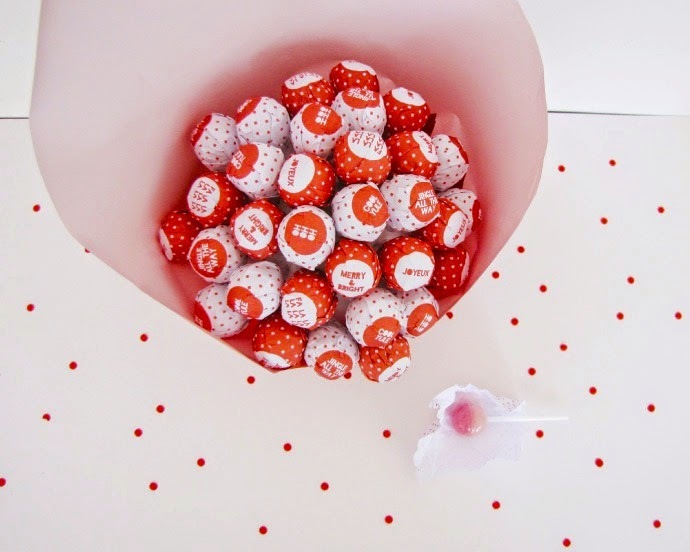 So, I thought I'd share how to make a DIY Lollipop Bouquet Gift. It's perfect to make as a Christmas present for the kid’s classroom this year or a neat present for a large bunch of people. (pardon the pun). Look closely, it's made of lollipops. And... it's super easy. The inspiration for this DIY came from a pin on my Party Stoppers Spot Board on Pinterest, I thought I'd take it one step further and add some printables for Christmas. 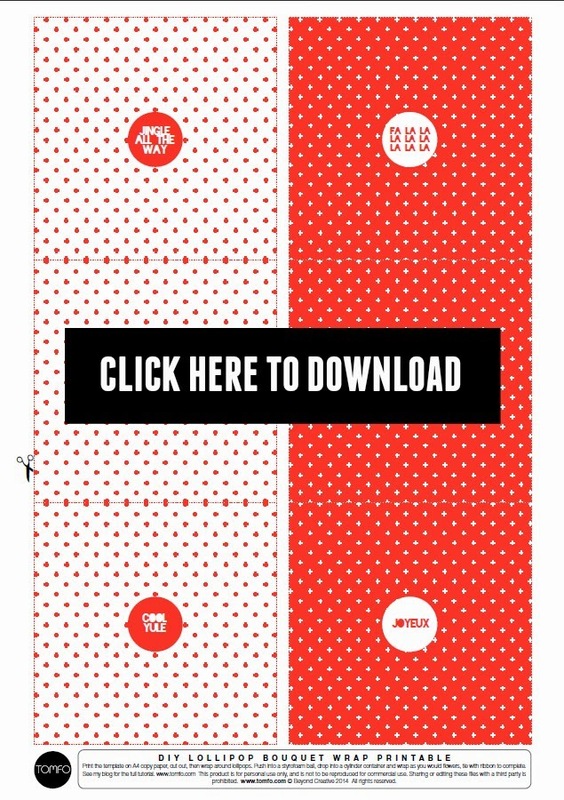 Step 1: Print out 6 x lollipop templates on A4 copy paper and cut out with scissors. Step 2: Wrap over existing lollipops, twisting and securing with cellotape at the bottom. (I made 32 lollipops. Step 3: Push them into the styrofoam ball. Step 4: Position them close so they touch each other. Alternating between messages and colour to make a bouquet on the top half of the ball. Then wrap with red paper, as you would a bunch of flowers. Tie with some ribbon and you’re done. You could also use some of my Free Printable Christmas Tags if you want to add a message. I think it's a great idea to make a gift when you have too many people to buy for but, you want to do something special. I'm giving this one to the kindy kids as it's my little guy's last year before big school. I hope you enjoy and if so why not "pin it" so you have it for later? 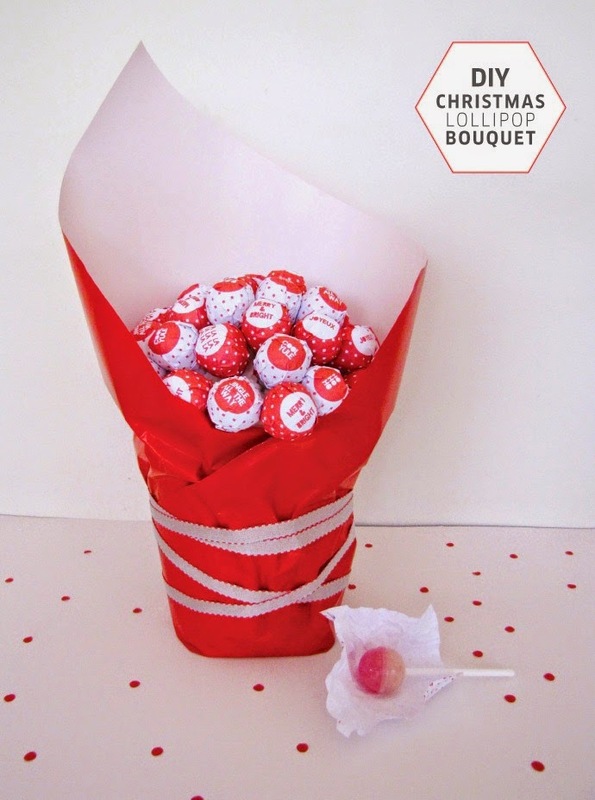 Download the free DIY Lollipop Bouquet printable here. P.S I've met this gorgeous lady, and she is just the most loveliest chick, exactly as she appears on this blog... but... even nicer.